The National Center for Ecological Analysis and Synthesis (NCEAS) has undertaken modelling to perform comprehensive spatial analysis and mapping of human pressures throughout the Mediterranean Basin. 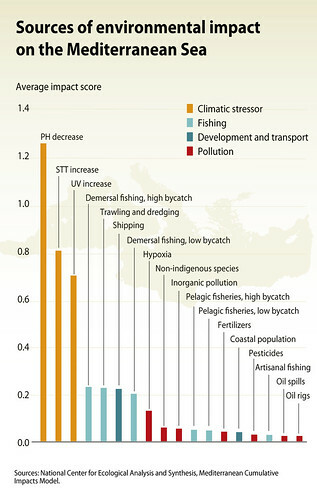 This work builds on a previous global analysis of cumulative human impacts (Halpern et al. 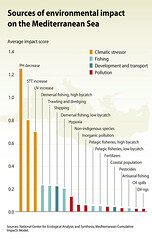 2008), including additional information to better reflect the specific pressures and ecosystems of the Mediterranean Sea and coasts. A total of 22 spatial datasets of human activities and stressors and 19 ecosystem types were assembled and used in the analyses and maps (NCEAS 2008). 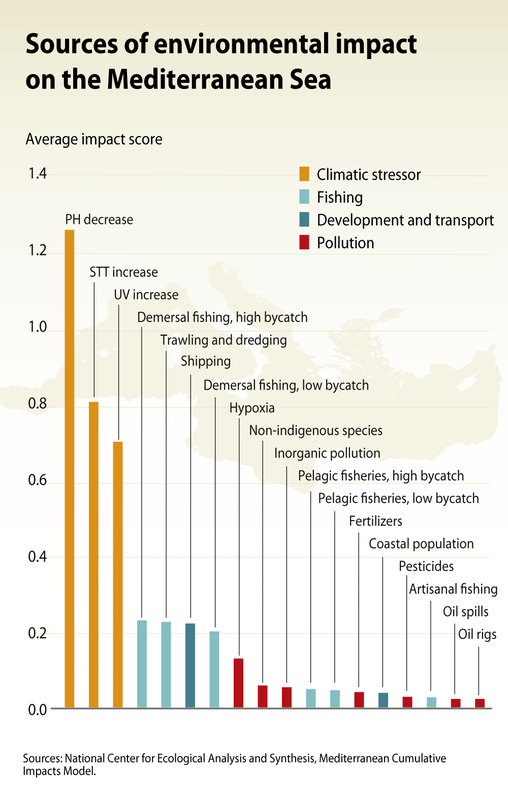 The analysis concluded that pressures that exert the greatest impacts on Mediterranean marine ecosystems are climate change, demersal fishing, ship traffic, and, in coastal areas, run-off from land and invasive non-indigenous species. The lowest estimated impacts are associated with oil spills and oil rigs, due to a combination of the limited spatial extent of these pressures and their overlap with habitats with relatively low vulnerability to these potential threats. The analysis shows distinct spatial patterns in the distribution of cumulative human impacts.